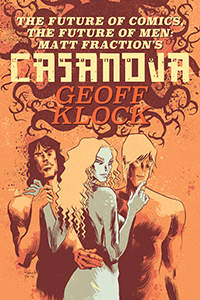 The second volume of Casanova (issues 8-14 of the original Image run and collected under the title Gula) with art by Gabriel Ba’s brother Fabio Moon, picks up soon after the end of the first volume, and like the title for issue #8 begins “in media res” with Cas undercover as Benny Alpha, a patient in a run down hospital trying to take down Doctor Klockhammer, an operative for X.S.M. (X. Super Mechanix, more about them later). Cas and E.M.P.I.R.E. are searching for information about a mysterious H-Element that can power deadly weapons and apparently affect time and space. Soon after, Cas and his team are given their mission to stop X.S.M. So far so good, but then the story takes a strange turn. 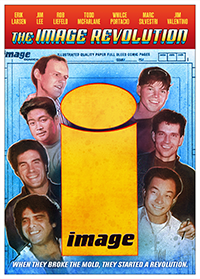 The next scene involves an operative of E.M.P.I.R.E. (presumed to be Cas) being chased by an H-Element-powered aircraft which is eventually brought down with the aid of the giant World War II-era robot which made its first appearance at the end of Luxuria. It is then revealed that the operative is Cas’s friend Kaito and that two years have passed and that Cas has been missing for that time. Beginning with issue #9, titled ‘When the Wolf Comes Home,” the narrative splits into two arcs: the search for Casanova and apparent return of Cas’s sister Zephyr, who was last seen at the end of Luxuria when she decided to go to the secret futuristic land of Coldheart to be with her mother and possibly reform herself, but who now appears to be working with X.S.M. as a contract assassin. These two story arcs are tied together with a simple question. Throughout the volume, members of Cas’s team, along Sasa Lisi, a blue skinned time traveler who makes her first appearance at the end of issue #8 (as the pilot of the craft chasing Kaito) ask “When is Casanova Quinn?” It’s a good question. First, casual readers skimming the text might misread the “when” for the much more common “where,” only to have it dawn on them the second or third time they encounter it. Second, it also points to the unusual way that these agents of E.M.P.I.R.E. and Sasa Lisi, an agent of a group called M.O.T.T. and a time traveler with a rather cavalier attitude about her chosen profession perceive their reality. Ultimately, it’s a question without an answer because the main point of the question is misdirection, which is a recurring theme throughout this story arc. At the end of the volume it’s revealed that Cas was never missing at all, instead he was (through a process that is ever explained) masquerading as his sister Zephyr in order to infiltrate and destroy both W.A.S.T.E. and X.S.M. Visually, Gula shares some important similarities and differences with volume one. First of course there is the color change from green in volume one to blue in volume two (with occasional panels colored green to denote flashbacks). As stated above, the art for volume two is by Gabriel Ba’s brother Fabio Moon who draws the characters in a way that creates continuity with what came before while at the same time adding a sense of speed with his looser lines, larger panels, and more facial close-ups. This also gives the book a more cinematic feel, but not in the sense of “widescreen” action which defined comics storytelling from around that time. Instead, Moon’s art and Fraction’s writing exists somewhere between European art house and American grindhouse films. Along with issue #9′s formal introduction of Sasa Lisi in the form of a sexploitation movie poster, issue #10 displays the influence of 1960s art house films, in particular Paul Bartel and Frederico Fellini. The plot for this issue involves Zephyr working with Kubark Benday from X.S.M. to eliminate anyone who has knowledge of H-Element technology on behalf of Newman Xeno, leader of W.A.S.T.E. and the primary antagonist from volume one, as well as Zephyr’s former employer/boyfriend. The first name on the list is Doctor Toppogrosso, a sadistic psychiatrist who secretly films terrible things happening to his patients and then forces them to watch their lives on screen. This plot point comes from Paul Bartel’s 1969 short film The Secret Cinema, which is about a woman who discovers that her entire life is being filmed by her friends and family. Toppogrosso even even calls it his “inhumane secret cinema.” Zephyr comes to him as a patient named Betty Alpha (a subtle clue as to her true identity since Cas called himself Benny Alpha when infiltrating Doctor Klockhammer) and eventually seduces and kills Toppogrosso, along with all of his compatriots in the theater while her own film plays on the screen. 8½ is about the struggles involved in the creative process, both technical and personal, and the problems artists face when expected to deliver something personal and profound with intense public scrutiny, on a constricted schedule, while simultaneously having to deal with their own personal relationships. It is, in a larger sense, about finding true personal happiness in a difficult, fragmented life. Beginning with the title to issue #10, “Seventeen” which is 8 ½ times two, elements of Fellini’s film permeate the story. The key to Zephyr’s plan involves a mantra that Toppogrosso says from time to time, “Asa nisi masa.” This is a phrase that the main character from 8 ½, the film director Guido Anselmi sees written on a blackboard at a party he attends. It’s a phrase from an old childhood game which, if spoken in front of a painting would make it come to life. This phrase subconsciously haunts Anselmi, a film director who can’t seem to get his movie made. The influence of 8 ½ extends into the art as well, in particular with the design of X.S.M.’s secret island base. In addition to eliminating anyone who has knowledge of H-Element technology, Newman Xeno has contracted X.S.M. to build a massive gun on the island, the purpose of which will be explained later. The massive gun makes its first appearance in issue #10 and bears a strong resemblance to the giant rocket ship set that is being constructed for Anselmi’s (ultimately never to be completed) film. At the time Fraction was working on Gula, Luxuria had come out and received a lot of positive notice and this, along with Fraction’s successful reboot of The Immortal Iron Fist over at Marvel, seems to have given him a lot of confidence in his abilities. As a result, Fraction adds some emotional complexity to Gula that was largely absent from Luxuria. This is especially evident in issue #13, titled “Some of the Things That Happened to the Murderers and the Murdered Among Us” in the way he explores sentience, something he had only briefly touched on in Luxuria. In fact, much of this issue is filled with flashbacks to events from volume one (easily seen because of the dramatic color shift from blue to green, something that is lost in the later colorized editions). The story for issue #13 picks up right after the events of #12, where Zephyr and Kubark raid E.M.P.I.R.E’s moonbase, ostensibly to kill her father. While she succeeded, it was one more misdirection because they actually wanted to steal Sasa Lisi’s H-Element rocket. In issue #13, it is revealed that the Cornelius Quinn Zephyr beheaded was actually a Seychelle robot. It is here that Fraction reveals the first of two truths about zephyr, that she was secretly assigned to infiltrate X.S.M. on behalf of E.M.P.I.R.E. In addition to decapitating her father, while Zephyr and Kubark were on E.M.P.I.R.E.’s moonbase, they killed a number of people, including Ruby Seychelle. Cornelius Quinn doesn’t seem bothered by this because all of the people killed were Seychelle duplicates. It was established back in Luxuria that Seychelle’s duplicates were practically indistinguishable from flesh and blood humans, with Ruby Berserko and Ruby Seychelle deciding for themselves what they wanted to do in their lives. It is Kaito who takes Zephyr’s actions the hardest because he and Ruby Seychelle had been in love and living together for the past two years. Kaito also refuses to have Ruby’s memories implanted in a new body, because he believes that to do so would diminish what they shared together. Instead he asks that she be given a memorial and then shot into space. As I stated in my two previous articles, the character Casanova Quinn is (or rather began as) an analogue of Michael Moorcock’s character Jerry Cornelius. However, the biggest difference between the two is Cas’s belief in, and desire for, redemption. Starting in Luxuria, Cas had a habit of turning enemies into friends. In fact, his E.M.P.I.R.E. team/circle of friends is made up mostly of former adversaries like Sabine Seychelle, Ruby Berserko, and Kaito. His personal desire for redemption comes from regret. The second truth about Zephyr Quinn is of course that she is actually Casanova. Presumably, the real Zephyr is still with her mother on Coldheart Island. Casanova becomes Zephyr on orders from his father so that he (or she) can infiltrate X.S.M. and discover why they are so interested in H-Element technology. While working with X.S.M., Zephyr discovered something unexpected: love. Like E.M.P.I.R.E., X.S.M. is a family organization with a father and son, Izzy and Kubark Benday, in the top spots. Izzy Benday at one time used to work with Cornelius Quinn, but the death of his wife during childbirth caused him to go insane and eventually form X.S.M. which is a super science terrorist organization similar to what A.I.M. used to be for Marvel Comics. In a somewhat ironic twist, X.S.M., although a terrorist organization is far less dysfunctional than E.M.P.I.R.E. with regard to the relationships between father and son. Izzy and Kubark are portrayed as very relaxed and loving while Cas and Cornelius are very formal and distrustful of each other, which only gets worse by the end of the story. Casanova, ever the narcissist, falls in love with Kubark soon after they start working together because he sees so much of himself in him. Fraction explores Cas’s narcissism further in issue #11. From the issue number to the title, “Naomi, I Moan,” the theme for #11 is reflection. In this story, Zephyr meets, falls for, and eventually kills her target, a woman named Suki Boutique. Suki is a woman who runs a high class island casino and was at one time a spy and a thief (her former partner Winston Heath was also killed by Casanova in Luxuria). Zephyr poisons Suki’s champagne and stays with her until she dies and tries to comfort her. Suki’s death clearly seems to affect Cas and he moves with determination to finish his mission. In the final two issues of the story, X.S.M. and Newman Xeno’s plan is finally revealed. X.S.M. has been building a massive gun to fire Sasa Lisi’s H-Element craft into space, the ultimate purpose of which is to ensure that Cas’s abduction from his original universe takes place. In the final issue, E.M.P.I.R.E. attacks X.S.M. island and Zephyr reveals herself to be a double agent. Kaito shoots Zephyr and the final secret is revealed when Cas’s psychomanifests erupt from Zephyr. Overcome with regret over the lies and the killing and seeing his one chance for redemption, Cas begs his father to not fire the gun so that everything that has happened since he was pulled into this universe would be erased, even though it would mean his certain death since Newman Xeno pulled him out of his universe seconds after he jumped out of the helicarrier casino. Cornelius, out of spite or revenge, decides to fire the gun and keep things the way that they are. When Cas is returned to his former self, he discovers quickly that life going forward will be difficult. First, he visits Kubark who is imprisoned at E.M.P.I.R.E. and tries to apologize and tell him that his feelings for Kubark were genuine, but Kubark furiously rejects him. Kubark, with the help of David X, escapes along with Newman Xeno. Cas next meets with his father who assaults him and tells him that he is little better than a prisoner and his job will be tracking down Newman Xeno and fixing problems that he had no part in creating. The one bright spot is that although Cas loses Kubark, he finally meets Sasa Lisi. Thank you for reading. This is a very tough story to write about and I’m sure I haven’t done it justice. The next article will focus on volume three: Avaritia, and will probably take me a long time to write. Tagged Cassanova, Fabio Moon, Gabriel Ba, Image Comics, Matt Fraction. Bookmark the permalink. I’m mainly curious what precipitated this change in particular; did Fraction feel like Sasa Lisi’s original answer was perhaps too naive? Is that simple change of dialogue somehow a signal of the overall story changing a bit from its original plan? I find it all quite fascinating. That’s interesting. Of the recolored editions, I only read “Luxuria” and thumbed through “Gula,” so I never noticed that before.